The Excellence in Career Development Award recognizes and celebrates faculty who work hard to contribute to the career development of Miami Students. Faculty and staff are vital members of Miami’s Career Community and are encouraged to assist students in developing the knowledge and skills needed to formulate and conduct a successful career plan. 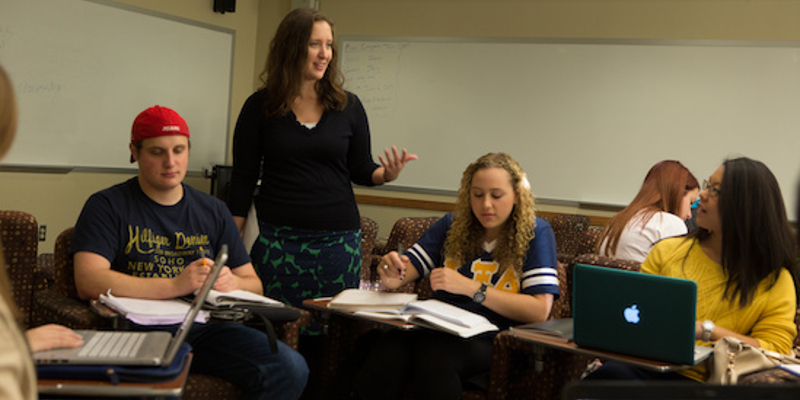 Each academic division has a Career Center liaison to advise students. Each maintains office hours and can serve as a career resource in the classroom. We invite you to learn more about our services, programs, resources, publications, and look forward to partnering with you to meet the career needs of our students. According to the results of the National Association of Colleges and Employers, employers are looking to hire candidates with outstanding communication skills who are team players. Students must be able to communicate the value of their degrees to employers. How Can I Help Support Student Career Development? The Center for Career Exploration and Success provides a variety of online resources to help guide students in their professional development that you can incorporate into your curricular and advising efforts. Please do not hesitate to contact us if you would like to have a Career Center staff member visit your class to speak on career and employment-related topics or to develop materials for your syllabus or Canvas site. Please schedule in advance so we can customize our presentation to your particular class.